Please note we are producing a limited number of these over the winter. What I list as on--hand is what I plan on producing - it is not actually ready to ship. Lead times will be about 4-8 weeks depending on the weather. That date range is a best estimate and is from the date of when you order. 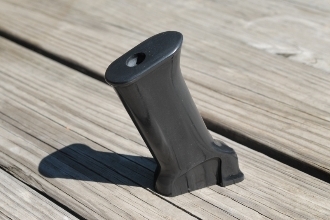 This is our US-made black solid cast version of the grip used on the IMI Galil rifles. There is a dimple marking the hole for the cross pin *if* you need to drill it for your particular rifle. Because not all Galil variants used the cross pin, we are not drilling it. This is one solid grip - it is incredibly strong! The Israeli's gave it thick top walls to begin with but once you add in the fact it is solid-cast, the strength is nothing short of amazing. It is, without a doubt, one of the most heavily made and best looking grips we sell. It is colored black with our black blasted finish for a sure grip. It uses one of our high-strength alloy 6x1x100mm screw to connect to the Galil's grip nut and the screw *is* included. We custom make all of our grips and furniture for each order. Because of this, our lead-time is usually at least four weeks and we post our order lead time on the home page of our website. Please check the lead-time before ordering. We had to add this as many folks are getting links from friends straight to our products and not realizing that we custom make everything.